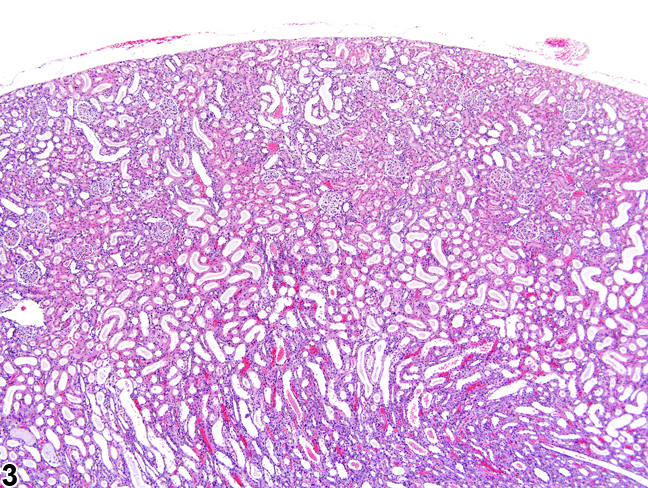 Kidney - Nephropathy, Obstructive in a female F344/N rat from a chronic study. Dilated tubules extending from the renal papilla into the cortex are characteristic of obstructive nephropathy. 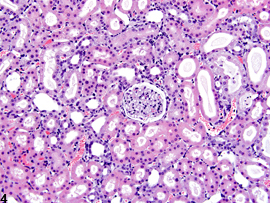 Kidney - Nephropathy, Obstructive in a female Harlan Sprague-Dawley rat from a subchronic study. This more severe case of obstructive nephropathy is characterized by dilated renal tubules and collecting ducts. 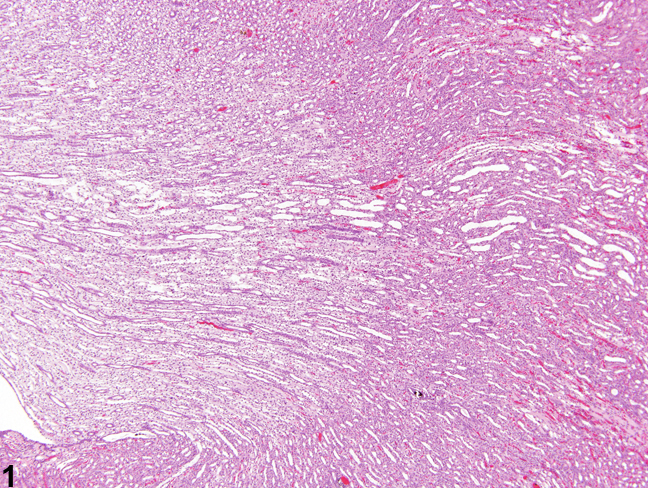 Kidney - Nephropathy, Obstructive in a female Harlan Sprague-Dawley rat from a subchronic study. There are cortical tubule and ductal changes, including dilation and tubule basophilia. 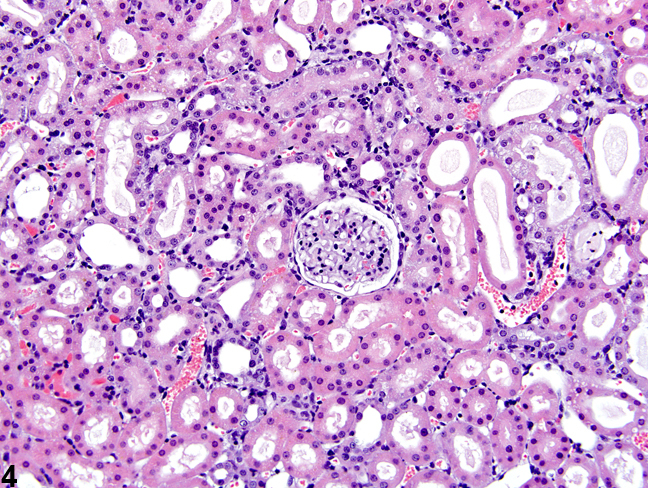 Kidney - Nephropathy, Obstructive in a female Harlan Sprague-Dawley rat from a subchronic study (same animal as in Figure 3). Tubule changes associated with obstructive nephropathy are shown. Obstructive nephropathy may result from inflammation associated with deposition of crystals, retrograde nephropathy, or a lower urinary tract outflow blockage. 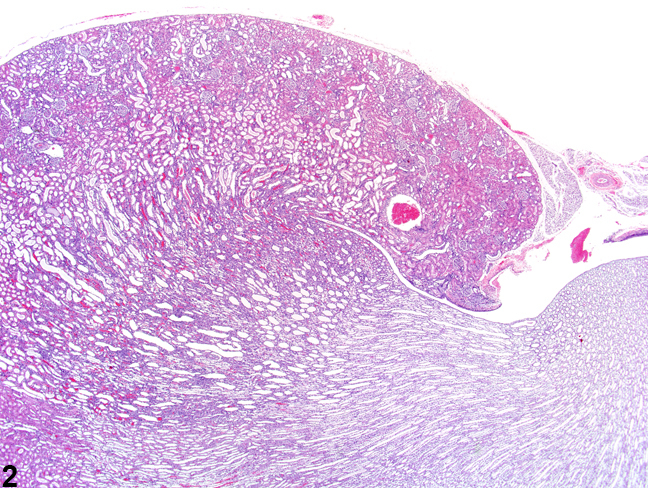 Whatever the cause, similar morphologic changes can be observed. Retrograde (reflux) nephropathy, a form of obstructive nephropathy, is related to a backflow phenomenon characterized by small clusters of dilated tubules that ascend from the papilla to the cortex and are due to increased urine reflux resulting from changes in the lower urinary tract ( Figure 1 and Figure 2 ). Lesions of the lower urinary tract contributing to obstructive nephropathy may not always be detected microscopically,and thus the pathogenesis may remain unclear. Tubule features often include foci or areas of cortical basophilic tubules with distal tubule and collecting duct dilation ( Figure 3 and Figure 4 ). Intraluminal inflammatory cells or an accompanying ascending pyelonephritis may or may not be present. 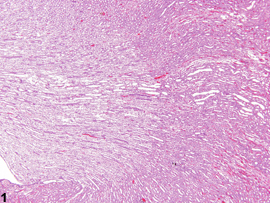 Resolving lesions may result in tracts of fibrosis. Obstructive nephropathy should be diagnosed and given a severity grade. Associated lesions such as inflammation and fibrosis should be recorded separately only if they are very prominent features. Whenever obstructive nephropathy is observed, the lower urinary tract should be examined for the cause. Obstructive nephropathy secondary to a neoplasm should not be diagnosed separately but should be described in the pathology narrative. Hard GC, Flake GP, Sills RC. 2009. 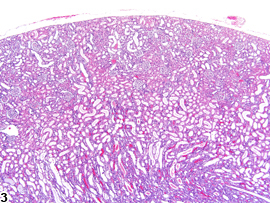 Re-evaluation of kidney histopathology from 13-week toxicology and two-year carcinogenicity studies of melamine in the F344 rat: Morphologic evidence of retrograde nephropathy. 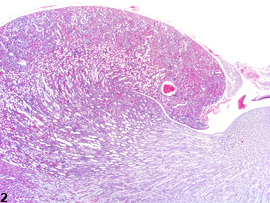 Vet Pathol 46:1248-1257. Heptinstall RH. 1998. Urinary tract infection, pyelonephritis, reflux nephropathy. In: Heptinstall’s Pathology of the Kidney, 5th ed (Jennette JC, Olson JL, Schwartz MM, Silva FG, eds). Lippincott-Raven, Philadelphia, 725-783.